Are your precious curls in need of moisture and softness??? 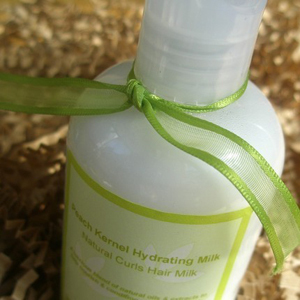 Our luscious Peach Kernel (Natural Curls) Hair Milk will soften, moisturize, detangle and control frizz. Use as often an needed to add moisture to your afro, curls, twists, braids, and locs. An excellent moisturizer and leave-in conditioner for parched curls. Use daily or weekly to hydrate your natural hair styles.